The Climate Change conference to take place the first two weeks of December were billed as a last chance to save the world, with even the words of Pope Francis twisted to imply that man-made carbon emissions were the problem. This is not in fact what Pope Francis said at all! Read carefully. He was addressing Earth changes such as melting glaciers. He did not cite the cause. The U.N. climate conference in Paris is most likely humanity's last chance to thwart global environmental disaster, Pope Francis said, warning the world was "at the limits of suicide". The pope was asked if the U.N. climate summit in Paris would mark a turnaround in the fight against global warming. "I am not sure, but I can say to you 'now or never'," he said. "Every year the problems are getting worse. We are at the limits. If I may use a strong word I would say that we are at the limits of suicide." He spoke of retreating glaciers in Greenland and low-lying countries at risk from rising sea levels. "I am sure that the (Paris delegates) have goodwill to do something. I hope it turns out this way and I am praying that it will," he said. 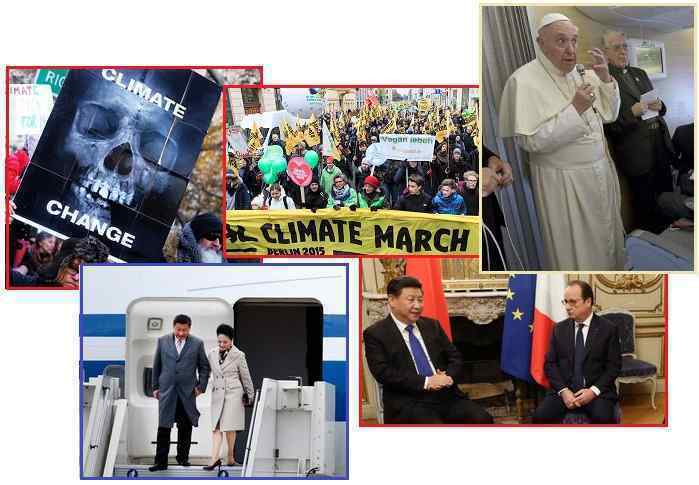 ZetaTalk Insight 12/5/2015: The Pope’s comments on the Climate Conference give a clue to the real agenda in Paris, as more than 150 Heads of State meet to discuss the future. The Pope did not say “man-made” Global Warming. He stressed that the problem is getting worse, that glaciers are melting in Greenland, and the seas are rising. He did not cite the cause, which of course is the pending passage of Nibiru, the increasingly violent daily Earth wobble, the 7 of 10 plate movements, and the increase in CO2 from exploding volcanoes. In that the Earth changes are caused by the approaching Nibiru, now increasingly visible in the skies, what is the point? Volcanic eruptions and earthquakes have increased dramatically, and have nothing to do with the temperature of the air. The daily Earth wobble, detectible by anyone observing where the Sun is rising and setting certainly has nothing to do with carbon emissions. What was actually accomplished by having 195 countries sign an agreement to reduce greenhouse gasses in 50-100 years? Global Warming assertions have been under debate from the start, and the advocates of the theory caught in fraud, as detailed in Issue 367 of this newsletter. Going into the Climate Change conference there was plenty of skepticism. Conventional wisdom holds that negotiators are hashing out a fair allocation of the deep emissions cuts all countries would need to make to limit warming. That image bears little resemblance to reality. The developing world, projected to account for four-fifths of all carbon-dioxide emissions this century, will earn applause for what amounts to a promise to stay on their pre-existing trajectory of emissions-intensive growth. A group of developing countries led by China and India has rejected “any obligatory review mechanism for increasing individual efforts of developing countries.” The final submissions are not enforceable, and carry no consequences beyond “shame” for noncompliance — a fact bizarrely taken for granted by all involved. Climate finance is the term for wealth transferred from developed to developing nations based on a vague and shifting set of rationales including repayment of the “ecological debt” created by past emissions, “reparations” for natural disasters, and funding of renewable energy initiatives. Developing countries are expecting more than $100 billion in annual funds from this agreement or they will walk away. We had one UK scientist, Philip Stott, who has said there are quite literally hundreds of factors governing global climate. For the UN to pick one politically-selected factor - CO2 - and then try to tweak it at the margins and then come up with some temperature goal 50 -100 years in the future, is akin to scientific nonsense. You could call it modern day witchcraft. Per the Zetas, since Heads of State are aware that a passage of Nibiru is pending, they are only straddling the fence during this Climate Change conference, posturing to blame man-made emissions if the announcement does not occur, and bargaining with other countries for migration permission or bribes if it does occur. Thus Obama’s happy announcement at the end of the conference looks suspicious. How do his reassurances gibe with his role of being at the helm when informing the public about Nibiru? These are mixed messages. With the sudden bang of a gavel Saturday night, representatives of 195 nations reached a landmark accord that will, for the first time, commit nearly every country to lowering planet-warming greenhouse gas emissions to help stave off the most drastic effects of climate change. 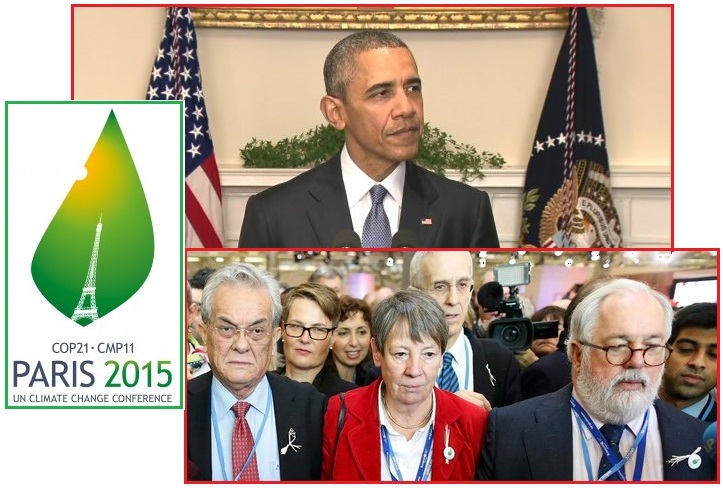 ZetaTalk Insight 12/5/2015: These Heads of State know that Nibiru is causing these problems. They also know there is a pending contested announcement admitting this to the public. In their minds, the issues to be resolved are what to say to their public in the event the announcement proceeds, and what to say to their public if the announcement continues to be repressed. Thus, proclamations straddle the fence, and allow for movement in any direction. These Heads of State are also acutely aware of the ZetaTalk prediction accuracy, and the grim prognosis for many countries of the world. India, in particular, is trying to broker immigration for its educated citizens in exchange for cooperation in the big lie that rising seas are due somehow to man-made emissions. China, with over a billion citizens to relocate, is guarding its border with India and Asia, using its funds to bribe other countries, in Africa and S America, to open their borders instead. Hillary has been accused of having an entitlement attitude. 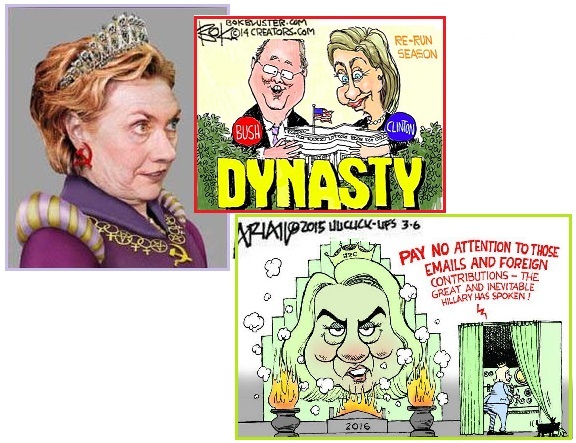 She is the Heir Apparent, and nothing can stop her ascension to the throne of the Oval Office. Despite an ongoing FBI investigation into Hillary’s email practices, she has exuded an air of confidence and a big entitlement grin, consistently. Hillary Clinton and Obama had a very private lunch at the White House on Monday, December 7, 2015. No photos were taken and the agenda was not revealed to the press. 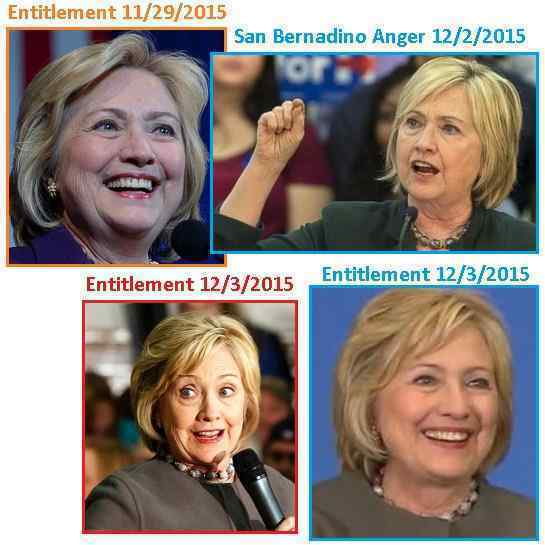 But the photos of Hillary on Wednesday-Thursday December 2-3 showed her entitlement grin or appropriate anger at the December 2 San Bernardino shooting. If she was to receive bad news during her luncheon with Obama, she was not yet anticipating it. The former rivals-turned-amicable colleagues met privately for a 90-minute "informal lunch" at the White House. The lunch was not on Obama's or Hillary Clinton's public schedules, and the White House did not disclose what exactly the two discussed. 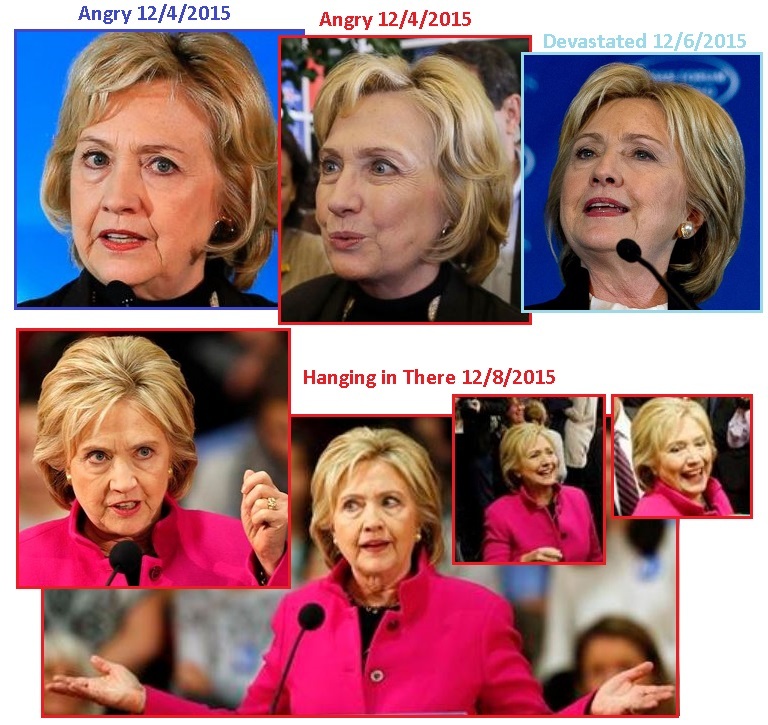 But photos of Hillary from Friday December 4 through to Tuesday December 8 showed anger or angst. Hillary has broken countless federal laws by her private server setup and treatment of classified material, but has obviously assumed she could get away with it. Per the Zetas, this matter is in Obama’s hands. ZetaTalk Insight 12/12/2015: Hillary has been going on the assumption that Obama would not dare allow an indictment to proceed, as there are no other Democratic candidates polling well enough against the Republicans at present. She feared Biden entering the race. But the idea that he withdrew as the announcement was about to delay the 2016 elections never entered her mind, as she likewise does not think Obama will pull off the announcement. By entering the race early, with a huge war chest from her Wall Street and Clinton Foundation sources, she is assuming she is indeed too big to indict, and is clear to sail to the White House. The outcome depends on Obama, who indeed plans to defer the 2016 election at some point due to the announcement admitting that Nibiru exists. Biden is expected to announce when and if the election cycle resumes, but it is unlikely to resume. Obama was indeed giving her bad news during the December 7 luncheon, as the FBI has sufficient cause to indict on several fronts, and the DOJ will proceed. Obama will not stop this, nor issue a quick pardon, so Hillary, under this cloud not only cannot posture as she has but in point of fact will be precluded by law from holding the office of President. What federal statutes has Hillary broken? This list is extensive and despite her practice of placing underlings beneath her to take the fall, is personally liable for most of them, even if none of her loyal underlings confess. As Secretary of State, she signed a paper acknowledging her responsibilities. The buck stopped with her, and the private email setup in her home certainly involves her by her actions or failure to take action. Many of the emails now labeled classified were “born classified” meaning by their nature they were such. The list of statues broken goes on and on. 18 U.S. Code § 798 – Disclosure of classified information. A federal prosecutor would naturally focus first on the most serious allegations: willfully transmitting or willfully retaining Top Secret and Compartmented (TS/SCI) material using a private server system. U.S. Code § 1924 – Unauthorized removal and retention of classified documents or material. The prohibited conduct is the unauthorized removal of classified information from government control or its retention in an unauthorized location. 18 U.S. Code § 2071(b) — Concealment, removal, or mutilation generally. The accused transferred and held the only copies of official government records (whether classified or not), the very existence of which was concealed from government records custodians. 18 U.S. Code § 641 – Public money, property or records. The prohibited conduct is the conversion of official records (whether classified or not) to the accused’s exclusive use and the mens rea is simply the intent to do so. An accused destroyed, withheld, or concealed the existence of official records being sought under subpoena by a committee of Congress. An accused knowingly concealed the existence of official records being sought by the Department of State Inspector General . 18 U.S. Code § 371 – Conspiracy to defraud the United States. The wire fraud conviction can be sought if it can be proven that accused used electronic means of communication in undertaking such scheme or artifice to defraud. 18 U.S. Code § 371 – Conspiracy to commit a federal offense. If any accused and any third party can be proven to have colluded in any violation of federal, criminal law, then all involved can be charged with criminal conspiracy as well. Agents are looking at U.S. Code 18, Section 1001, which pertains to "materially false" statements given either in writing, orally or through a third party. Violations also include pressuring a third party to conspire in a cover-up. Each felony violation is subject to five years in prison. This phase represents an expansion of the FBI probe, which is also exploring potential violations of an Espionage Act provision relating to "gross negligence" in the handling of national defense information. Then there is the issue of how all that material arrived intact on her homebrew server, when it was blocked from leaving the secure State Department servers. Did Hillary’s IT guy Pagliano, who worked directly for Hillary both as an independent contractor and at State, create a software workaround to toss emails over the wall? Pagliano took the 5th, and refused testimony before Congress. The FBI subsequently seized four State Department servers. Bryan Pagliano, a former Hillary Clinton staffer who installed and maintained the family's private email server, invoked the Fifth Amendment during his appearance before the House Select Committee investigating Benghazi. I watched her face after the luncheon with Obama for any evidence. Is she happy? Is she distraught? Her facial expression changed by Wednesday December 9. 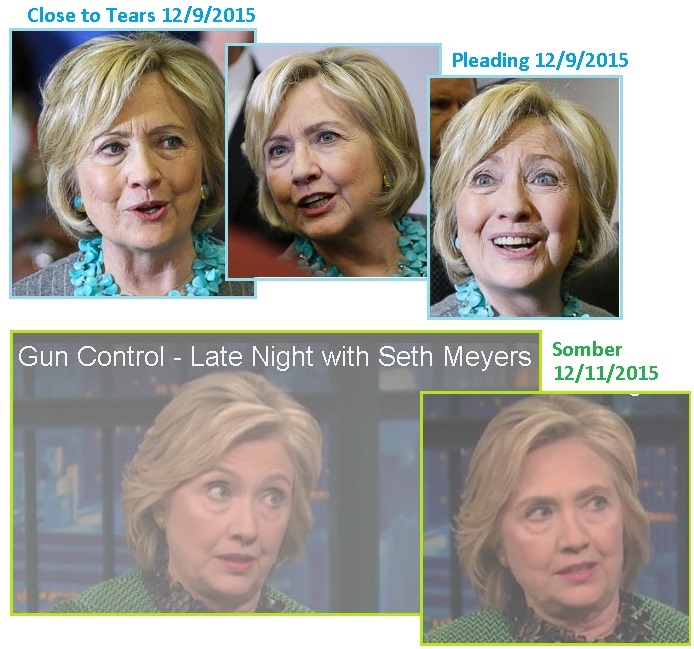 She looks like she is crying, pleading while campaigning in Iowa, or somber and no longer flashing that entitlement grin on a late night show December 11. Per the Zetas, she will not drop out of the race, as requested by Obama, but will try to intimidate him. ZetaTalk Insight 12/12/2015: As Hillary proceeded to maintain her campaign after this news from Obama, is appears she does not intend to exit as a candidate gracefully. She will be pushed, kicking and screaming, from the stage. She will at first basically dare Obama to proceed, trying to create such momentum, so many endorsements, so much cash and endless campaign ads on TV, that he will change his mind and lose his resolve. Obama asked Hillary to consider the Democratic Party, the impact on its reputation, but Hillary is hardly of that mind set. How this drama ends is in the hands of the Democratic Party, as the parties in the arena have taken their positions and picked up their weapons. Game on! Hillary has certainly tried to assert control over the process, declaring via proxies in the press that those two Top Secret emails had been reduced to a harmless status, and having friends in the State Department take various email out of the inspection process. 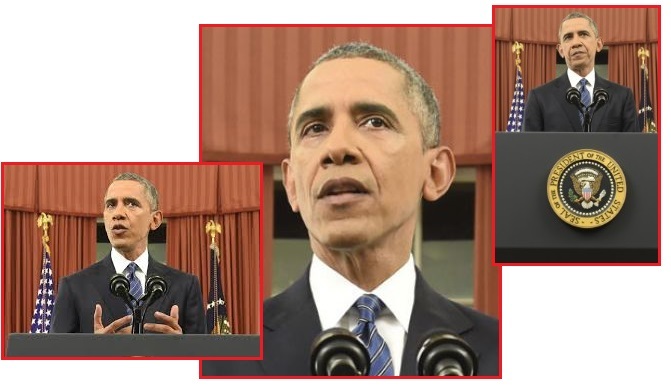 Obama did not look happy about the fight ahead on Sunday, December 6, 2015. At least four classified Hillary Clinton emails had their markings changed to a category that shields the content from Congress and the public in what State Department whistleblowers believed to be an effort to hide the true extent of classified information on the former secretary of state’s server. The four emails originally were marked classified after a review by career officials at the State Department. But after a second review by the department's legal office, the designation was switched to "B5" -- also known as "deliberative process," which refers to internal deliberations by the Executive Branch. Such discussions are exempt from public release. The B5 coding has the effect, according to a congressional source, of dropping the email content "down a deep black hole." Planet X has had a long history. From the days in early 1980 when the dark star that was a gravity draw out in the direction of Orion was called Nemesis, to the days in 1983 when Nibiru was sighting by the NASA/JPL infrared balloon out in that direction, to the days in 2006 when astronomers Walter Cruttenden and Michael Brown declared that long-period comets and Sedna were pulling in that direction, due to the gravity pull of some mysterious object – Planet X has been in the news. Many objects, such as Sedna, have been called Planet X, a much overused term. Meanwhile, NASA has declared all speculation wrong. As recently as 2011 saying there is no Nibiru, no Planet X. Go back to shopping, sheeple! But now, suddenly, the discussion has been revived. It’s a big, dark presence at the farthest reaches of our solar system, a mysterious force powerful enough to skew the paths of planets in orbit and yet so subtle that it slips undetected past even the most powerful telescopes on Earth. It’s known as Planet X. And a group of astronomers said they’d found not just one such presence, but two of them. Using data from the Atacama Large Millimeter/submillimeter Array (ALMA) telescope in Chile, astronomers found a faint object in the Alpha Centauri star system that's closest to Earth. After analyzing the data, the astronomers ruled out that it may be another star. Instead they posit that the object is orbiting our own sun in the outer realm of our solar system – meaning it could be the much sought-after "Planet X." Is there a SUPER EARTH on the Edge of our Solar System? Astronomers believe they have discovered two of the most distant objects ever found in our solar system. Using the Alma telescope, researchers from Sweden and Mexico noticed mysterious objects crossing their field of view as part of separate studies. It's difficult to tell exactly how far away these objects are, but their speed and brightness suggest that they are unlikely to be stars. One of the objects, they say, could be a 'Super Earth' located six times farther away than Pluto. The studies have already drawn scepticism from other astronomers who say they are likely to be something known as super-cool brown dwarfs. Brown dwarfs are cosmic bodies that never burn fusion at their core. Scientists sometimes refer to them as 'failed stars.' While the latest studies do not rule out this possibility, they add that both objects may be a good candidate for 'Planet X'. ZetaTalk Overview 12/19/2015: What are these objects found by the ALMA array in Chile? We have stated that the Sun’s dark unlit twin, its binary, is some 18.74 Sun-Pluto distances away, and that these two binaries are in a static dance with each other, no motion toward or away from each other. One of the objects is described as being 6 times the Earth-Pluto distance away, much closer at hand. The ALMA objects were discovered in the direction of the constellation Centauri. Nibiru comes in from its second foci, the dark unlit binary of the Sun, from the direction of Orion, but these two constellations are in the same general vicinity. It is speculated there is only one object, a moving object, but there are two. If they were found 6 Sun-Pluto distances away, Sedna, which orbits the Earth, was found to move 3 Sun-Pluto distances away during its orbit. Are these new objects in orbit around Earth? They are not, but rather in a static dither. We mentioned Nibiru spent most of its life midway between its foci, in a dither, only drifting close enough to Earth to make a pass every 3,600 years or so. We mentioned that Nibiru began its sling orbit coming out of the Big Bang, and thus must forever remain in this sling orbit, but other objects in the vicinity were not trapped in this manner. Planets orbit their suns because they are close enough to be affected by the rotation of matter within their suns, the sweeping arms we have described. If the distance is sufficient, and if the planetary mass has more than one gravity draw calling to it, it will dither. These two new discoveries are proof of a second gravity draw in the direction of the constellation Orion. Meanwhile, the subject of Planet X, aka Nibiru, is again in the news!